A number of studies provide evidence for the existence of ovarian cancer stem cells, defined by functional attributes, foremost the ability to reconstruct the heterogeneity of the original tumor in immunocompromised mice through asymmetric cell division. As satisfying as the concept of an ovarian cancer stem cell is to explain the origins of ovarian cancer, can this concept be applied universally to explain the diversity in the histologic types of epithelial ovarian cancer? 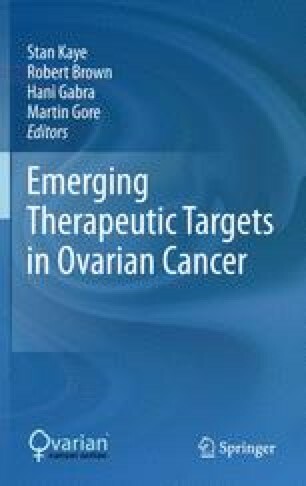 Can the unique features of an ovarian cancer stem cell population be exploited to therapeutically disarm these cells? Herein we explore these questions, beginning with a brief description of cancer stem cells in general and then turning more specifically to what is known about ovarian cancer stem cells. We then explore the potential for therapeutic targeting of these cells, and what the future holds for implementation of such approaches toward improving survival of women with ovarian cancer. We gratefully acknowledge support from the Liz Tilberis Scholars Program of the Ovarian Cancer Research Fund (SKM), the Gail Parkins Ovarian Cancer Awareness Fund, and the Barbara Thomason Ovarian Cancer Professorship from the American Cancer Society (AB).